Imagine it?s 2050 and 1000 people are now living on Mars? what would Christmas be like? 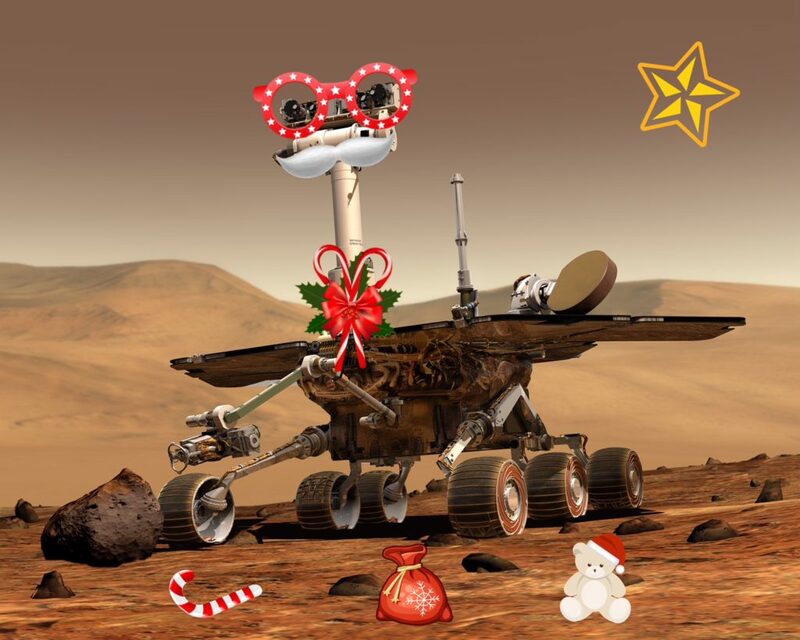 Christmas on Mars hasn?t always been a fun occasion; one Christmas in 2003 the British-built Beagle 2 probe crashed while trying to land. Since then however much progress has been made. This year, 2050, sees children born recently on Mars figuring out how Santa travels 310,283 km from Earth?s north pole to get to their habitat module, and adults gaining enjoyment from reminding their blue-planet friends how Mars? rotation means Christmas (like all days) lasts 39 minutes longer. For some though, debate continues to rage about whether Mars should celebrate December 25th at all. With our new home taking 687 days to go around the sun, many colonists have become more familiar marking their year by the 4 seasons we experience, with some arguing that keeping to an Earth holiday that sometimes comes once a year, sometimes twice, is holding them back from developing their own new culture. Who knows, one Christmas soon, Mars might even choose its own end of year holiday! To quote early Mars settler and author of Becoming Martian Josh Richards’s words from before he migrated, ?on the psychology side of things it’s critical to celebrate whatever and whenever you can, so just like Shackleton’s crew on Endurance you’ll celebrate Christmas just like Earth does while making the most of what limited resources you have.? The weather for this yuletide season is as usual nothing like the white Christmases many on Earth enjoy. While its well known that a type of snowfall does occur in Mars?s upper atmosphere, December 25 this year is forecast to feature a typically large dust storm thus making this year yet another ?red? Christmas. Temperatures will vary depending on where you are. For instance if you are making the trek to celebrating near an Earth object like NASA?s now dead Curiosity Rover in the mid-northern hemisphere, the days could be as warm as 36 degrees Celsius. The nights however are definitely suitable for toasting chestnuts over whatever kind of fire your Mars base allows when the temperature drops to as low as minus 90 degrees. If this year finds you living in one of the more magnetized areas of the planet, this will be the one day of the year when the ?Christmas Lights? name given to Mars? auroras as long ago as 2014 by Earth scientists actually makes sense. As for Christmas dinner, the food replication tech promised by our Governor has not yet been delivered, so 3D-printed Turkey?s are out. The now traditional potato and radish pie will surely be on your menu though – and maybe even some home-brewed space beer for the adults? Whatever supplies you have, here?s hoping that Christmas 2050 on Mars is a blessed time of family and friends.